Moving from a paid job to self-employment is the dream of many people who are currently employed and receive monthly pay-checks. If you have been employed for a long time and have become addicted to a pay-check, breaking out might be an arduous task. It is similar to taking the mouth of a baby from sucking. How does the baby survive? That is how it feels for most people, hence they are often unable to liberate themselves and pursue something that they might enjoy better and have the potential to bring them more financial success and happiness. Some people have had plans and dreams for many years and written brilliant business plans but the fear of the unknown inhibits them from taking that jump. A little inner voice tells them it might be a jump into oblivion. So they tell themselves, tarry here awhile and awhile often turns into years and decades of unfulfilled dreams and promises. Some people might have been better singers or poets or farmers if they only tried hard enough to follow through with their dreams. Some others would have been running highly successful talk shows and comedy programmes had they developed enough guts to press hard and chase their dreams. The saying is true that the place with the most dreams and potentials in the world is the cemetery. The cemetery is the final resting place for un-tapped dreams and wasted talents. Everyone has an inherent gift or talent. Discovering your gift starts with self-interrogation. Your gift occupies your thought most of the time and you dream of achieving it. Talents in their raw form are really of no use. Develop and exercise your talent. Get a mentor. Successful people learn how to move despite their fears. Let the size of your dream inspire you to deal with the fear of failure. The road to success is often filled with hurdles and setbacks. Failure teaches you how better to do it. Your dream may be big but you are not expected to start big. Start where you are and start today. Being your own boss doesn’t mean less work. Hard work does not kill but laziness does. For your dream to see the light of day, you will have to work with people who are either as smart as or smarter than you. You need to jump and make your dream a reality. Get out. Break out. Liberate yourself. For many people, the challenge is how do I start? What is the process to transition from a paid employment to being your own boss and doing something for yourself? How do you deal with the constant nagging fear that tells you that you will fail? How do you deal with the challenges that might arise when you jump and start? How do you break free from a pay-check addiction? These and many are the issues that are on the mind of anyone who ever ventured out and started something of their own. The reality we must all deal with is that no matter what, certain people will never leave their jobs even when they have ideas that can potentially change the world. There is a place for such people because being an employee is not such a bad thing. But there are a few others known as trailblazers and world changers who will dare to dream and have the fortitude to go out there and get their hands dirty. Getting your hands dirty is part of the requirements for success. That is why a seed is first planted in the mud or soil because it can multiply. Let us examine the seven ways you can transition from paid employment to achieving your dreams. The first and most important criteria to aspire to venture out is to identify your gift. Everyone has a gift that he/she was born with. You can choose to call it talent. It is that thing that you can do and achieve great results with minimal effort. Some are able to discover theirs and apply it and change their world and society. Like the proverbial man who buried his talent, some people simply never discover theirs or believe they have no talents. If you ever aspire for greatness, it is absolutely vital that you discover something that you are good at because it holds the key to your greatness. Every great person who ever lived or is alive today accomplished great things because they discovered their purpose and talent and used it for the betterment of humanity. Discovering your gift starts with self-interrogation. Take a trip down memory lane and discover that one thing that you have done and excelled at. Your gift occupies your thought most of the time and you dream of achieving it someday. You might be a terrific sales person but you are working somewhere as a desk officer. Your gift might be creating and designing things but you are confined to a job of selling. People often end up being average when they do jobs where they have no talent. It is not enough to discover your gift but you must take it a step further and develop it. You may have a gift but as long as it is undeveloped, it will be of little use to you or anyone else. There are lots of people who have great talents and are frustrated because they have refused to apply themselves and develop their talents. Talents in their raw form is really of no use. That is why gold and other precious minerals are of no value or use until they have been refined. So the second most important thing in deciding to pursue your ambition is to take the time and pay some money to develop that thing that you are good at. All the world’s great people only became great by developing and exercising their talents. You might have the talent to be a boxer but if you do not train and develop yourself, you are simply dead on arrival. Get a mentor who has done a similar thing that you dream of and learn under him/her. Study the biographies of successful people and learn how they dreamed and applied tenacity in pursuing their dreams. You will also learn how they overcame setbacks and became successful, despite the odds. Your dream must be bigger than your fear. When you walk into a supermarket or a shopping mall, has it ever occurred to you that everything there is owned by someone. Successful people learn how to move despite their fears. It is quite normal to be afraid but you do not allow fear to hinder you from pursuing your dreams. The desire to move from a guaranteed pay-check into self-employment is frightening but remember that your employer must have been an employee at some point in his life. If he had allowed fear stop him, he would not be where he is today. Let the size of your dream inspire you and deal with the fear of failure. There is always the fear of the unknown which is the reason why many are where they are today. Some people awfully detest their jobs but they are unwilling and unable to try something because of the fear of the unknown. You must allow yourself to dream and let that dream be the inspiration to move on despite your fear. All the products and services you see in all the shopping malls in the world are the dreams and aspirations of people. You can join them and be able write your name in gold or you can continue to cringe with fear and refuse to make your life count. Understand that failure is not such a bad thing. Truth is, failure is not such a bad thing. Every great person has their share of failure but didn’t allow failure to hinder them from pursuing their dreams. Can you even imagine how many times Thomas Edison and Michael Faraday must have failed in their journey to discover electricity? You need to study the story of the Wright Brothers who invented the aeroplane. They didn’t get it right the first time but they didn’t stop until they accomplished their goals. The road to success is often filled with huddles and setbacks and it is normal. If success could be attained on a platter, everybody would have been successful. You need to understand this principle from the beginning that if you are really interested in being successful. The fact that you failed doesn’t make you a failure. What makes you a failure is resignation and unwillingness to try again. Failure teaches you how better to do it. Starting where you are is vital for business success. Your dream may be big but you are not expected to start big. Some people are waiting for the right conditions to start. They want everything to be in place. Such people will never start. It is like a farmer who refuses to go to his farm because there is rain. What if it rains every day? Start where you are and start today. Be ready to work harder than you ever worked. You should never be under the illusion that being your own boss means less work. All great entrepreneurs sometimes work twenty-four seven in order to achieve success. You must understand that hard work does not kill but laziness does. If you are afraid of hard work, you should stay on your job and keep earning your pay-check. When you step out, you will be required to work at times and under all conditions. You will have to work at odd hours and make calls even when you do not feel like. But the truth is that if you already work hard on your job and are successful, chances are that if you put in same effort into something that you started, you will be successful. Find the right people who can work with you. You are only as smart as the people you surround yourself with. Show me your friends and I will tell who you are. For your dream to see the light of day, you will have to work with people who are either as smart or smarter than you. Get people who have skill sets that you do not have to complement you. Don’t be a jack of all trade because you will not make a success of it. 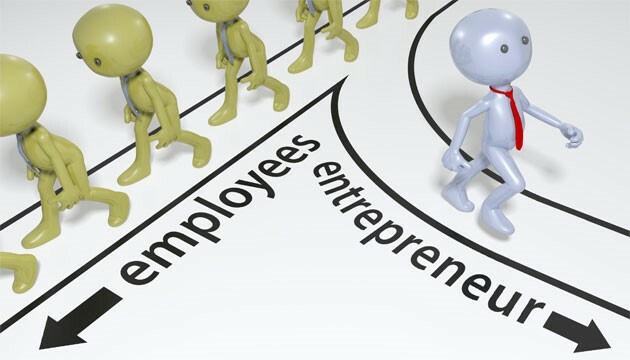 Great entrepreneurs are good managers and galvanizers of people. Lastly, you need to jump. Get out. Break out. Liberate yourself. Emancipate your mind. You can dream all you want and write the best business plans in the world but until you jump, it all amounts to nothing. The last bit is the most difficult for most people because they have become comfortable and complacent. Their senses and minds have been dulled and lulled by the constancy of a pay-check. You need to jump and make your dream a reality.